A map of the Allied invasion of the Balkans - that never happened. This is an enlarged, separate issue version of a 1943 R. M. Chapin, Jr. map of the Balkans and eastern Europe created for TIME Magazine. The map depicts the region from Germany and Poland to Turkey and from Berlin and Belgrade to the Soviet Union and the Black Sea. 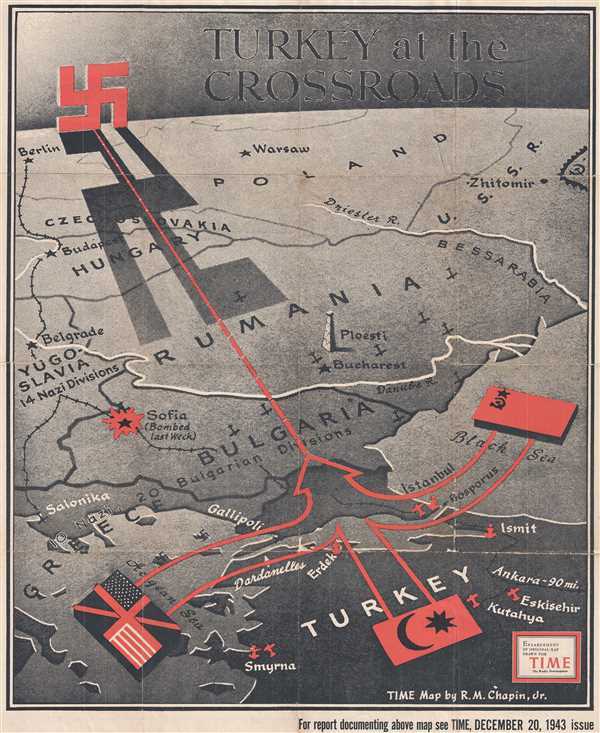 Illustrating a proposed Allied advance across the Bosphorus and into Greece and Bulgaria, this little-known front of World War II saw some harrowing action. The map notes that Sofia, Bulgaria was bombed 'last week' and Ploeisti, Romania in August was the costliest Allied bombing raid of the war. In that raid 53 aircraft and 660 airmen were lost. Although an Allied invasion of this style never occurred, the simple threat tied down Axis (German) troops and stoked resistance efforts in the region. It also helped stall, and then reverse, the stretch of the 'shadow' of Nazi Germany. This map is an enlargement of a map that was created by R. M. Chapin Jr., a TIME Magazine cartographer, for the December 20, 1943 issue of TIME Magazine. Good. Backed on archival tissue for stability. Even overall toning. Exhibits some loss along original fold lines. Blank on verso.